Same!!!! Screencap via the Guardian. 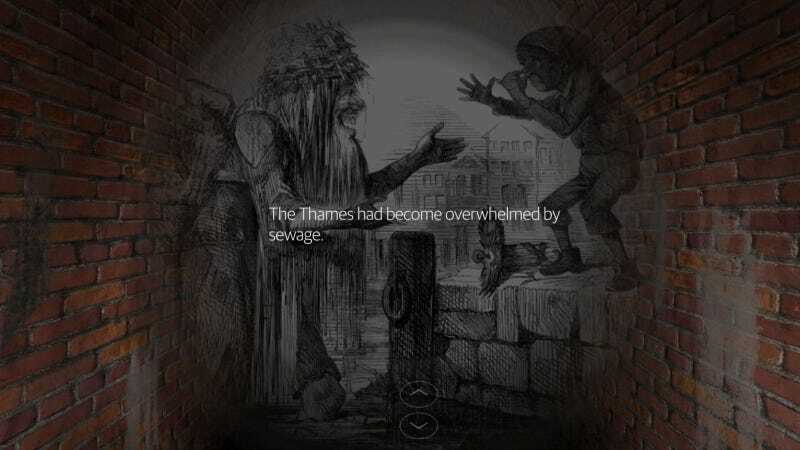 Here’s a suggestion for sometime in the next few hours, as your strained attention span finally collapses under the weight of world events: Spend some time crawling through London’s Victorian sewer system. Doesn’t the cool, slimy, stinking underbelly of the city sound surprisingly appealing right now? The Guardian (via Digg) has put together a VR tour of the creation of the London sewers, complete with a trailer and everything. You can’t get the full experience unless you’ve actually spent your money on a VR headset, which I most certainly have not. But you can get a version of it here, with a bunch of historical info framed by sewer tunnel walls and soundtracked with the damp sounds of the underground. It’s mostly the highlights of the story—cholera, the Great Stink—so if you’re a real Victorian sewage enthusiast you’ll be covering familiar reeking territory. But what a way to meditate on the importance of government spending, right? Also, FYI, London’s sewers are artisanal.